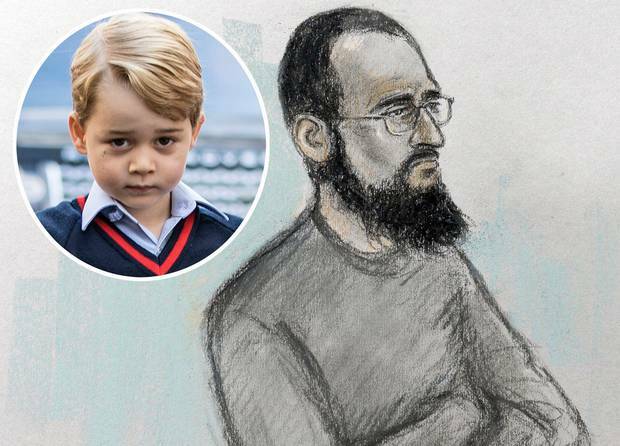 A mosque teacher used a chilling image of Prince George, his school and Isis terrorists to illustrate his plan to kill the young royal. Husnain Rashid, 32, admitted urging jihadis to kill the Duke and Duchess of Cambridge's son, as well as other children, by poisoning their ice cream, the Daily Mail reported. He gave "unstoppable and hate-filled encouragement" to would-be terrorists on carrying out attacks with poison, chemicals, bombs and knives via his secret extremist online forum, called Lone Mujahid. The Isis fanatic, who taught at the Mohamadi Mosque in Nelson, Lancashire, passionately suggested targeting 4-year-old Prince George at his £18,000-a-year ($34,000) prep school. He posted details about the eldest son of the Duke and Duchess of Cambridge, including his photo, the school's address and a black silhouette of a jihadi fighter with the caption: "Even the royal family will not be left alone". The rest of the royal family was also on a "hitlist" in a "book of terror" Rashid shared online with followers, who called him Rapunzel. Rashid had maintained his innocence throughout proceedings at Woolwich Crown Court, but today unexpectedly admitted a string of terror offences. He appeared, heavily bearded, in the dock wearing a grey prison tracksuit, black skull cap and glasses and replied "guilty" as the four charges were read out to him. The rest will lie on file. Adjourning sentence, Judge Andrew Lees told him: "For the past week I have listened to the most disturbing allegations. "You have admitted these allegations of encouraging others to commit terrorist activities and publishing statements to encourage the killing of others. "It is undoubtable that you will receive a lengthy prison sentence and the question of your future dangerousness and the protection of the public is a matter that I will have to give very careful consideration." Rashid was bent on encouraging wannabe jihadis to cause carnage in Britain. He had encouraged followers to poison ice cream and attack football stadiums, and was even planning his own online magazine offering tips for "lone-wolf attacks". He was even running his own "brand" on the Telegram application called the "Lone Mujahid", which he used to share advice and encourage lone wolf attacks. This included a suggestion to weld blades to the front of a 4x4 vehicle to cause as much carnage as possible when it was driven at speed through crowds. Rashid said he was desperate to travel to Syria - although it appears he never tried. He contacted a notorious British jihadi, Omar Ali Hussain, 31, who appeared on BBC Newsnight boasting of fighting with Isis since 2015. Hussain, who is thought to have been killed last October, worked as a Morrisons security guard in High Wycombe, Buckinghamshire, before going to Syria in 2013. He featured in a video for the terror group entitled Message of the Mujahid, in which he wore camouflage clothing while holding an assault rifle. Rashid allegedly gave battlefield tips to Hussain, who called himself Abu Saeed Al Britani, advising him how to bring down aircraft with lasers and weaken enemy defences by jamming missile systems. Other targets included the Halloween Parade in New York and railway stations in Australia. Rashid was consulted by terrorists around the globe seeking advice on poisons and explosives, and he was also working on an online magazine to be named The Lone Mujahid. He sent 290,000 messages on encrypted Telegram chat groups – calling himself Rapunzel – before he was arrested at his home last November. When police raided his house in November, Rashid is said to have hurled a phone containing the "treasure trove" of evidence into an alley. Prosecutors said Rashid was encouraging terrorism by posting a photograph of the prince at the school super-imposed with silhouettes of two masked jihad fighters. But nearly two weeks into his trial, the defendant was re-indicted and pleaded guilty to three counts of engaging in conduct in preparation of terrorist acts and one count of encouraging terrorism. The charges covered offences spanning from October 2016 to April this year. Two charges of dissemination of a terrorist publication and one of failing to comply with a notice under the Regulation of Investigatory Powers Act will lay on file.